In Chinese numerology, three is considered a good number where one of its connotations means life. 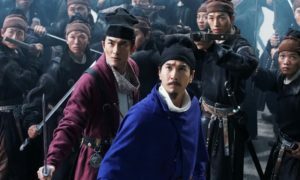 As it turns out, in director Tsui Hark’s part three of his latest trilogy, the line between real and supernatural is explosively and poetically blurred. Yet what’s clear is the Detective Dee series has resurrected Tsui’s career. 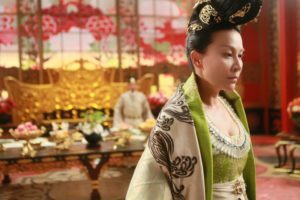 The reality also is that it’s a franchise based on the real life statesman Di Renjie (A.D 630-700) of the Tang dynasty court who was resurrected as a fictional character in the mid-1700s Ching dynasty Detective Dee wuxia books, which were resurrected into English-translated Judge Dee novels by author Robert Van Gulik in the mid-1940s. 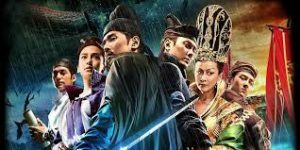 And finally, though most of the world has only seen the film in 2D, last night’s screening of Detective Dee: The Four Heavenly King (DD3) was the North American premier of it’s original and ultra-far out $129 million-earning, seen in China, 3D version. Thus the completion of the triple resurrection. Now if you think I’m pushing things, wait until you see the outrageously delectable DD3 in 3D, the second prequel to the original Detective Dee and the Mystery of the Phantom Flame (2010), where Tsui pushes the envelope backwards to yesteryear as with much more advanced CGI, he’s back to the foundation of his superb storytelling ways from Zu: Warriors from the Magic Mountain (1983). With Zu, Tsui became the father of a whole new genre of martial arts cinema called fant-Asia, that Boxoffice magazine noted was one of the most important genres of its time. 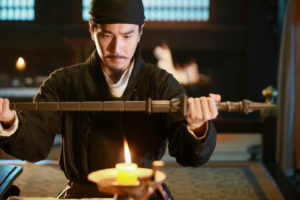 DD3 continues where the previous installment, Rise of the Sea Dragon (RSD) ends, when to the chagrin of Empress Wu Zetian, her husband Tang Emperor Gaozong, bestows upon Dee (Mark Chao) the coveted weapon Dragon Taming Mace, a symbol of Dee’s ranked importance and responsibilities to the throne. Forged in iron from star dust and harder than a golden stone, it’s an early version of a jiu jian bien (nine-section whip), which was originally a solid iron weapon with nine vertebral sections fused together like a pagoda. 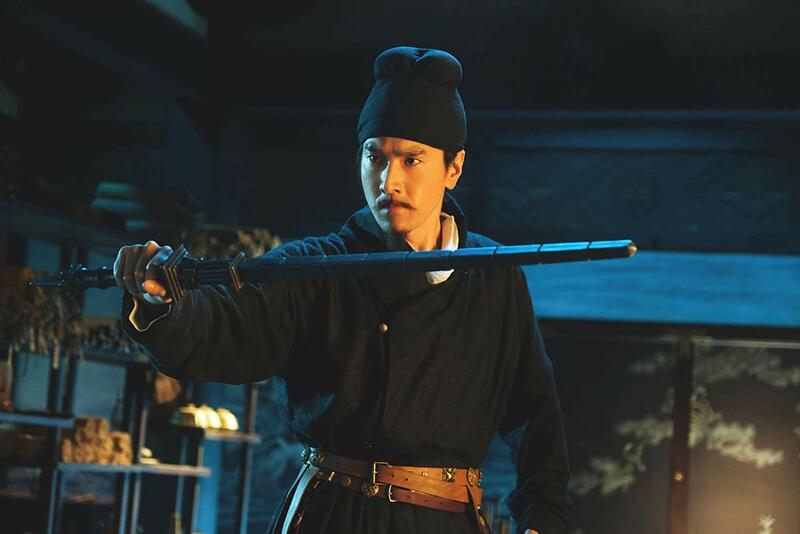 Wu orders Dee’s sworn blood brother from RSD and Supreme Court Head Yu Chi (William Feng) to retrieve the Mace with the help of her most recent minions, five untrustworthy Jiang Hu warriors known as the Mystic Clan so named due to their overwhelming weapon skills and black magic powers. With names like Wind Rain, Spectral Blades, Night Ghost, Smoke Valont and the alluring Water Moon, you just know something far out is soon going to happen. And it does. Though her plans fails, Wu is in cahoots with the feared Wind Warriors, who have unspeakably demented sorcery skills and is headed by the revenge-filled, Emperor hating Faceless Warrior who brandishes a most hideous weapon that when it locks onto someone’s head, it can’t be moved. As the demonic world arrives, Dee and his band of archers and swordsmen must battle ungodly creatures and necromaniac weapon wielders. And here’s where Tsui goes nuts for tentacles, ape for shooting eyes and philosophically fishes for carpe diem. Similar to Zu, in DD3, Tsui addresses didactic and morally instructive themes where he gracefully intertwines Chinese myth with comic book action. It’s a roller coaster of eye-popping magic powers, spiritual sustenance, world-protecting deities, killer poltergeists, supernatural high vaulting villains and down to earth heroes. In Zu, the movie’s formidable demon, the Evil One, a large red beastie that continuously changes, was genius. One moment it’s fire, a red blanket, a ghost and then whatever else was decipherable via quick-cut editing maneuvers and spliced far out visuals. DD3‘s formidable demon, the Faceless One, is large, red and also continuously changes yet the sheer lavishness and somewhat raw special effects of Faceless One and his pseudo-airborne monstrous arrays blends well the fight choreography where the imaginative flying blades and spinning swords are pure golden magic as is the ferocious appearance of a magic golden dragon. 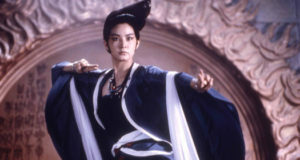 Though most of the action is pure CGI mayhem, there’s a handful of really nice, noteworthy swords fights that whet our combat appetites, the first one is right off the bat as Wu wily introduces Yu Chu to the Mystic Clan. Side note. In real life, Wu Zetian was a concubine to the second Tang emperor Taizong (A.D. 626-649) aka Li Shimin. Some may recall that Jet Li’s character in The Shaolin Temple (1982) rescued Li from his father’s evil Sui Dynasty enemies. It’s curious that the head of the Mystic Clan looks like the villain that captured Shimin in Shaolin Temple. When Taizong died, his son ascended to the throne under the moniker emperor Gaozong and married Wu and the start of Di Renjie’s political career. When Gaozong died of a supposed stroke, Wu became the Empress of China and renamed the dynasty from Tang to Zhou, which she ruled from A.D. 660 – 705. As Yu Chu battles one-on-one against each of the Mystic Clan to prove to Wu that these vagabonds are not worthy of her trust, when he clicks into duel-sword wielding mode especially against Spectral Blades who brandishes two bladed weapons akin to Klingon Bat’leths, yet they’re much more damaging and fearsome, you’ll be agog at the fight’s helicoptering ferocity and martial skill level. Laced with breakneck speed, precision spinning and cunning sound effects, the fight ends and we know that these two will meet later on, and they do. Their second dual occurs at The Temple of Four Heaven Kings where Yu Chi uses Dee’s Dragon Taming Mace. It’s when we finally see the weapons awesome power, especially when it’s wielded by a well honed warrior. The warping blade, deflection skill sound vibrations used during combat reaches new sonic heights. Like the 3D version of the film as a whole, it’s just awesome to watch man. In the vein of Marvel films, watch the final credits carefully to the bitter end as Tsui goes many steps beyond in preparing the audience for what appears to be the maniacal rise of Wu…maybe. SDAFF 2018 Opening Night - Little Forest: Where's the Beef (Bulgogi)?